Lock in a great price for NH Danube City – rated 8.4 by recent guests! I liked the food, the location and the overall building. Decent pricing. Metro access is just 5 minutes walking distance from the property. Great hotel & service! Buy the offer with breakfasts as they are super great value for money spent! Hotel Elegant , close to the historical center and the subway station, the airport express station is right next to the hotel ! Diverse and quality breakfast ! 1 block from metro station connecting to city downtown. Very easy and fast ride. Staff was very friendly and helpful. Supermarket few steps away. Clean and warm. Staff friendly. Underground just 5 minutes away and taked you to the Center in 10 minutes. Staff is very polite and speaking many languages, location is great, there was large free parking behind the hotel building, walking distance to 2 metro stations, 24/7 gas pump and spar express across the street. NH Danube City This rating is a reflection of how the property compares to the industry standard when it comes to price, facilities and services available. It's based on a self-evaluation by the property. Use this rating to help choose your stay! 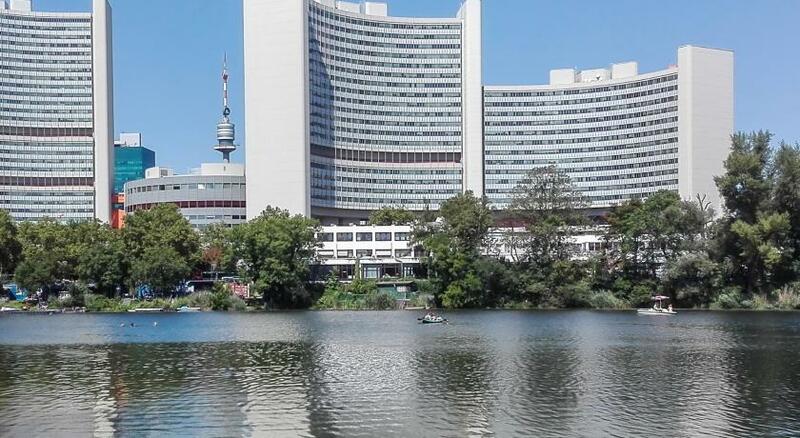 One of our top picks in Vienna.Located just an 8-minute underground ride from the center of Vienna and only 350 feet from the Alte Donau Leisure Area, the NH Danube City is right next to the United Nations headquarters and the Austria Center Vienna. The underground stations of Alte Donau & Kaisermühlen are within 1,650 feet. All rooms feature individually adjustable air conditioning, free WiFi, flat-screen TVs, 2 telephones, and tea and coffee-making facilities. They offer views of the Danube Park and Danube Island, with its wide range of sports and recreational activities, or alternatively of the city with the Stephansdom Cathedral. The Tarragona Restaurant & Bar offers a large breakfast buffet. For lunch and dinner, it serves Austrian and international cuisine and a wide range of Spanish tapas. The Tarragona bar located in the lobby welcomes guests to relax and unwind until late in the evening. The NH Danube City additionally offers a sauna, a fitness room, and a relaxation room. In the public spaces as well as in the business center, which is free for guests, Wi-Fi wired internet connections are available free of charge. The Donauzentrum, Vienna’s largest shopping center, is only 1 underground station away. The public airport bus stops directly in front of the hotel and provides a regular connection to the VIenna International Airport. 22. Donaustadt is a great choice for travelers interested in convenient public transportation, sightseeing and history. When would you like to stay at NH Danube City? These spacious rooms are fitted with blue and yellow colors and come with carpeted floors, tea and coffee making facilities, adjustable air conditioning, a mini-bar and a flat-screen TV with international channels. In addition, they feature a bathroom with a bathtub and a hairdryer, and soundproof windows. Ironing facilities are provided on request. These quiet rooms are located on the upper floors of the hotel and offer views of the surroundings. They are decorated in warm colors and fitted with modern furnishings. They come with hardwood floors, tea and coffee making facilities, a mini-bar, adjustable air conditioning and a flat-screen TV. In addition, they feature a bathroom with a bathtub and a hairdryer, and soundproof windows. These spacious rooms are fitted with blue and yellow colors and come with carpeted floors, tea and coffee making facilities, adjustable air conditioning, a mini-bar and a flat-screen TV with international channels. In addition, they feature a bathroom with a bathtub and a hairdryer, and soundproof windows. Ironing facilities are provided on request. An additional bed can be provided upon request to fit 2 adults and one child up to 12 years. An additional bed can be provided upon request. This triple room has a flat-screen TV, air conditioning and mini-bar. 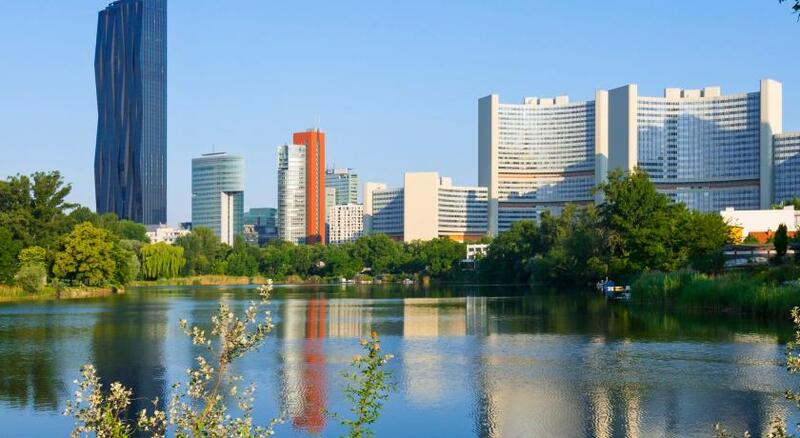 Whether you are travelling for business or for pleasure, you can discover the beautiful sight of Vienna and the growing business district. Our high comfort in all rooms, the F&B outlet with bar, restaurant and terrace make our guests feel special. Hotel surroundings – This neighborhood is a great choice for travelers interested in convenient public transportation, sightseeing and history – Check location Great location - show map Guests loved walking around the neighborhood! House Rules NH Danube City takes special requests – add in the next step! NH Danube City accepts these cards and reserves the right to temporarily hold an amount prior to arrival. It wouldn’t hurt if the staff smiled more often. My rating would certainly go up if the room service staff were less cold. The pillows were marshmallow soft, and bed very comfortable. Breakfast offered a diverse and delicious buffet. Room service was always on time - necessary with my busy schedule. I will stay again! Proximity to UNO is spot on. Kagran mall just one train stop away. I appreciated the support by reception staff. great location. close to either the airport shuttle bus or the U Bahn station. nice environment. enjoy the view. Close to the conference center and the U-Bahn. Direct connection to the main railway station and airport bus stopping in front of the hotel. Spacious rooms. The furniture was rather old and worn and some amenities (e.g. shoe sponge, slippers) were missing. Also, the iron machine was quite old and basic. I have seen much better ones in other hotels. In room tea, coffee offerings, not good at all. Reception manager was impolite. He didnt answer my questions and just looking to screen. I waited more than an hour for check in. There's no USB ports to charge the phone .. parking was expensive ..